AP-MALDI Mass Spectrometry Imaging of Gangliosides Using 2,6-Dihydroxyacetophenone. Featured Paper of the Month – January 2019. Gangliosides are complex glycosphingolipids and have been implicated in brain development, neuritogenesis, memory formation, synaptic transmission and aging. Disruptions in ganglioside metabolism has been linked to several diseases such as Niemann-Pick C, and Gaucher disease types II, Alzheimer disease and Guillain-Barre syndrome. 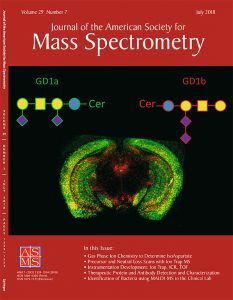 GD1s are the most abundant ganglioside species in the mammalian brain and consist of two structural isomers, GD1a and GD1b.Traditionally, the only way to analyze these isomers by mass spectrometry involved extraction and thus the researcher loses information about the location of the isomers in tissue. By combing an atmospheric pressure MALDI source and our matrix coating step, we were able to generate different fragment peaks that allowed us to distinguish the separate distribution of GD1a and GD1b in brain tissue sections by mass spectrometry imaging. The ability to image GD1b separately is important because the GD1 isomers are produced by different biosynthetic pathways. Thus, observed difference and changes, especially in disease models, may represent changes in one specific biosynthetic pathway. J Am Soc Mass Spectrom, 29 (7), pp. 1463–1472, 2018, ISSN: 1879-1123 (Electronic); 1044-0305 (Linking). Matrix-assisted laser/desorption ionization (MALDI) mass spectrometry imaging (MSI) is widely used as a unique tool to record the distribution of a large range of biomolecules in tissues. 2,6-Dihydroxyacetophenone (DHA) matrix has been shown to provide efficient ionization of lipids, especially gangliosides. The major drawback for DHA as it applies to MS imaging is that it sublimes under vacuum (low pressure) at the extended time necessary to complete both high spatial and mass resolution MSI studies of whole organs. To overcome the problem of sublimation, we used an atmospheric pressure (AP)-MALDI source to obtain high spatial resolution images of lipids in the brain using a high mass resolution mass spectrometer. Additionally, the advantages of atmospheric pressure and DHA for imaging gangliosides are highlighted. The imaging of [M-H](-) and [M-H2O-H](-) mass peaks for GD1 gangliosides showed different distribution, most likely reflecting the different spatial distribution of GD1a and GD1b species in the brain. Graphical Abstract . Home / News Main / Featured Paper of the Month / AP-MALDI Mass Spectrometry Imaging of Gangliosides Using 2,6-Dihydroxyacetophenone.